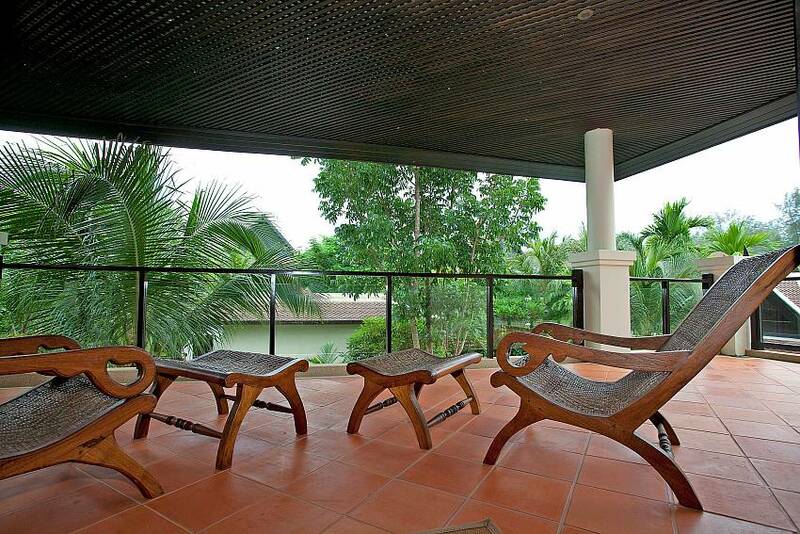 Located within 500 meters of Layan Beach, this tropical villa has 4 bedrooms and a modern Asian tropical design. 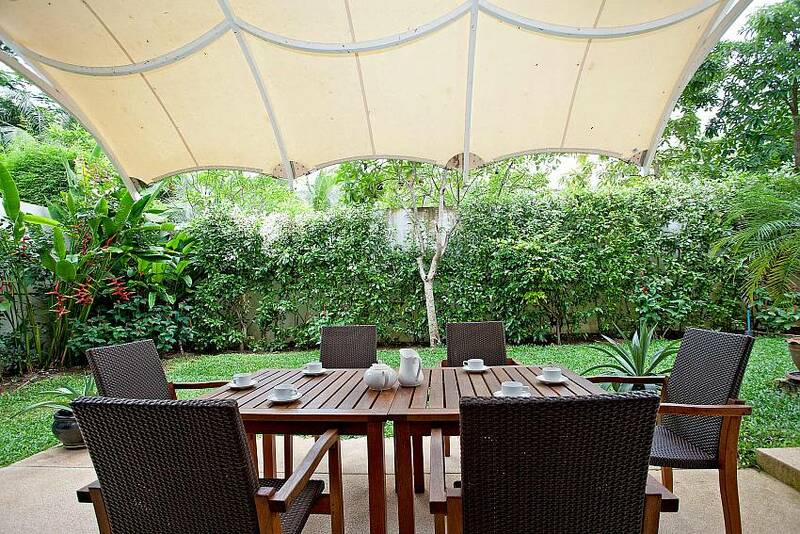 Maan Tawan’s quiet location is perfect for a relaxed Thailand holiday, making it a good choice for families and friends who crave a peaceful atmosphere. 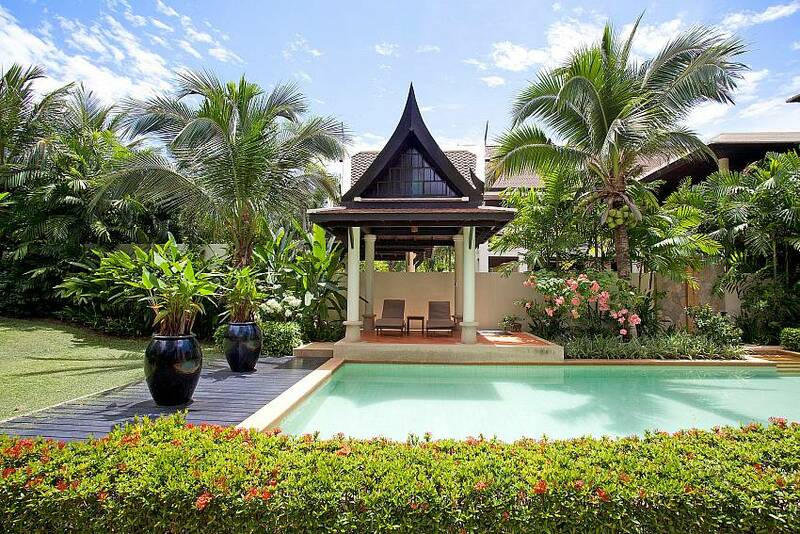 Just 500 meters from Layan Beach and close by to all the conveniences you’ll need, the Maan Tawan Villa has all the tropical trimmings one could ask for. 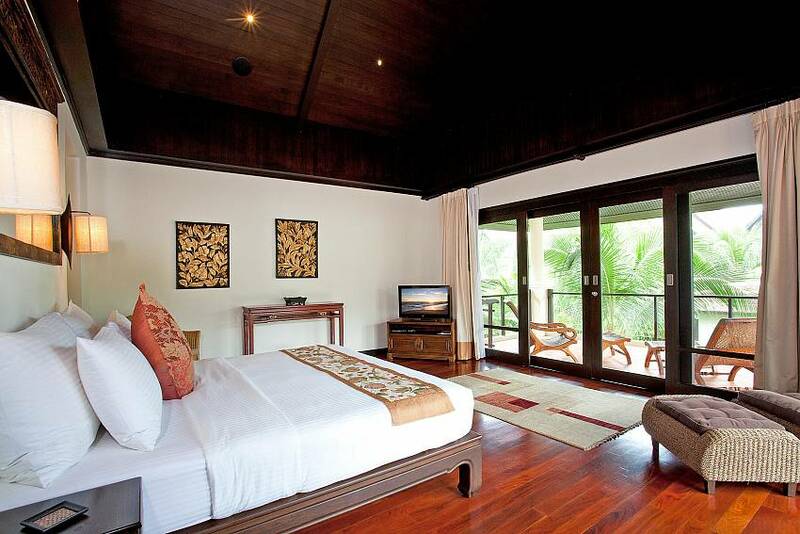 Situated at the northern end of Bang Tao Bay, this villa is a personal paradise. 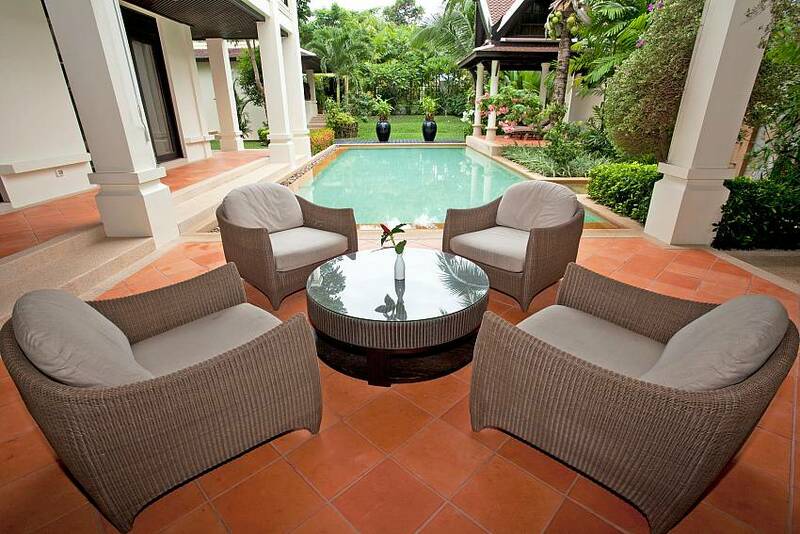 The garden really is a treat to look at with its neatly landscaped flora and stunning pool area. The Villa itself is equally as stunning, with incredible architecture and covered terraces spanning two floors and all the comforts and luxuries you’ll need and desire, contained within. 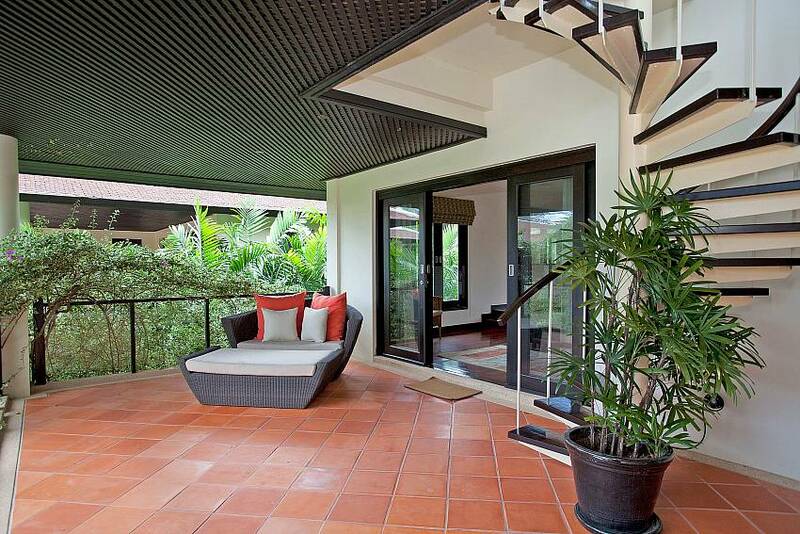 Situated on the western coast of the island, the villa is just 500 meters from the Layan and Bang Tao Beaches. 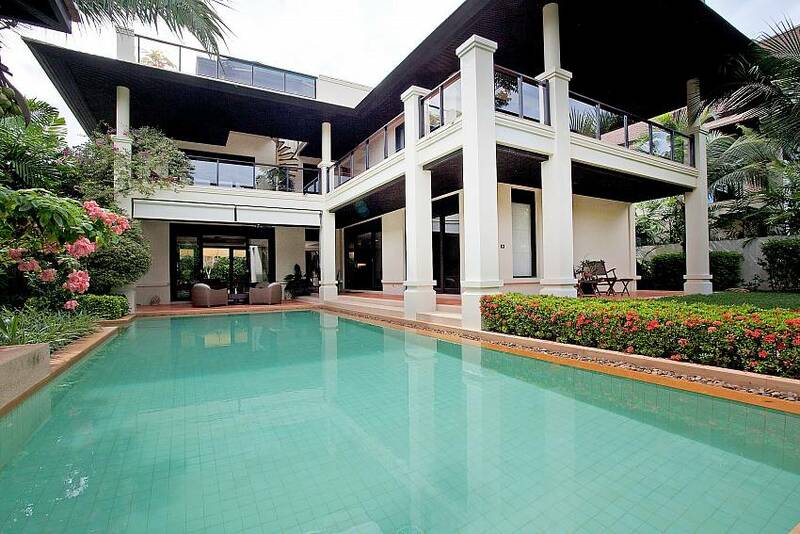 All of the region’s best restaurants, shops and bars are just 5 minutes away, as is the Laguna Phuket Golf Club. 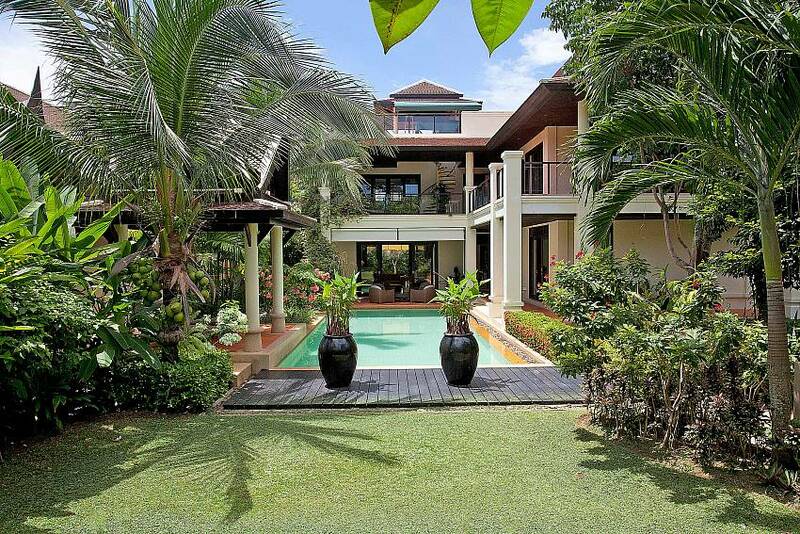 Other popular beachside destinations nearby are Surin Beach and Kamala Beach, which is also home to one of Phuket’s number one tourist attractions, Phuket Fantasea. Patong Beach can be reached in 20 minutes by car. It’s an exciting area where you’ll find plenty of Thai and international restaurants, as well as an action packed nightlife. 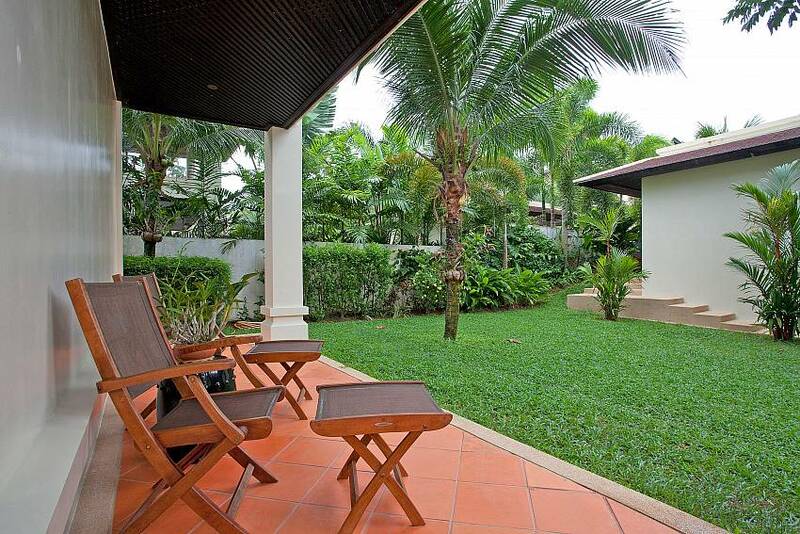 Browse our full listings of villas in Phuket. 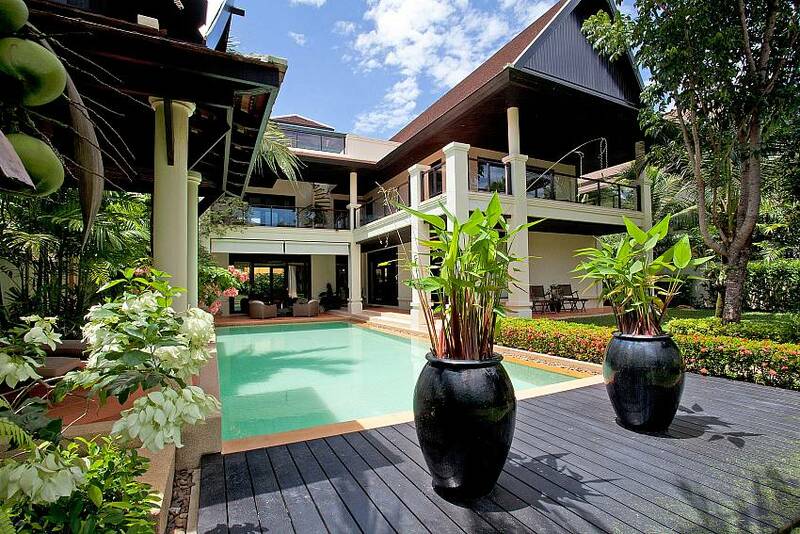 There are four bedrooms in total. 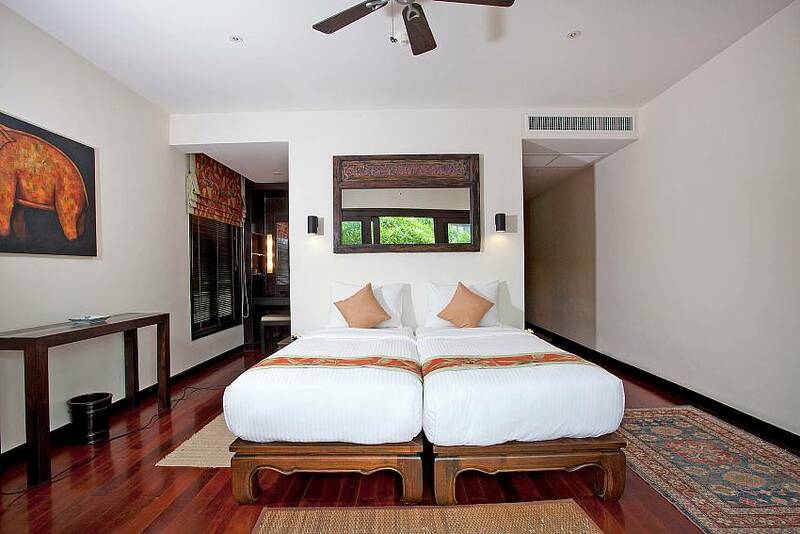 Two have double beds and the other two have two single beds, which can be joined to create a double. 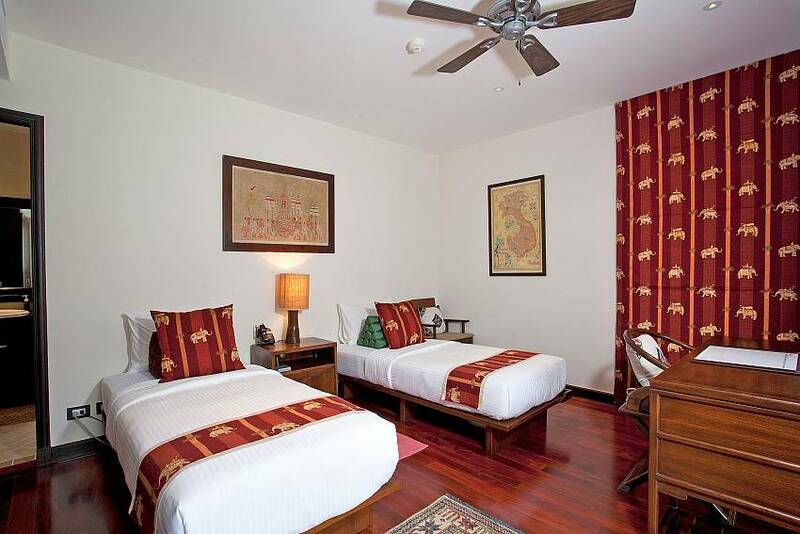 All the bedrooms have air-conditioning and ensuite bathrooms, as well as direct access to the balcony and terrace. 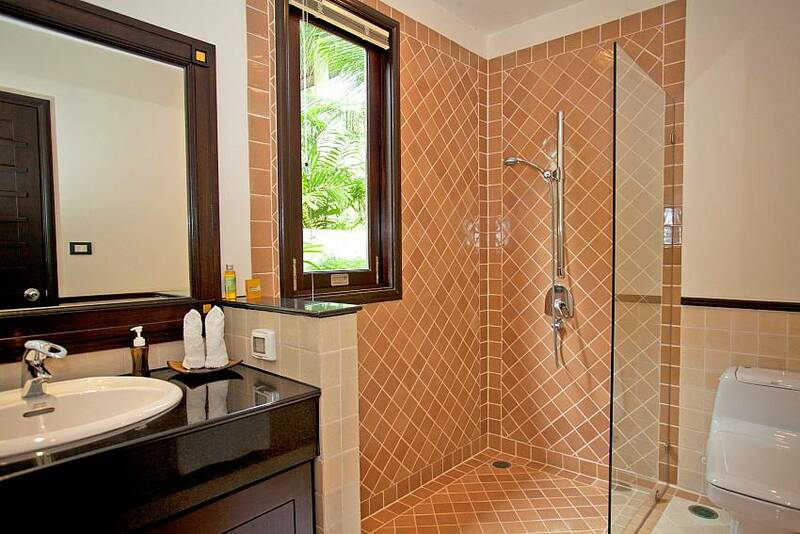 There are five bathrooms in total, four of which are ensuite. 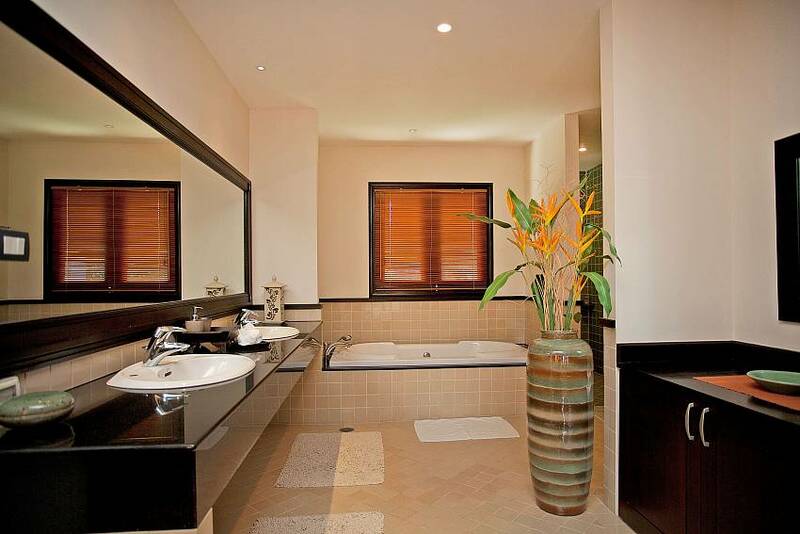 All four ensuites have showers, western toilets and wash basins and three of those bathrooms have luxurious sunken bathtubs. 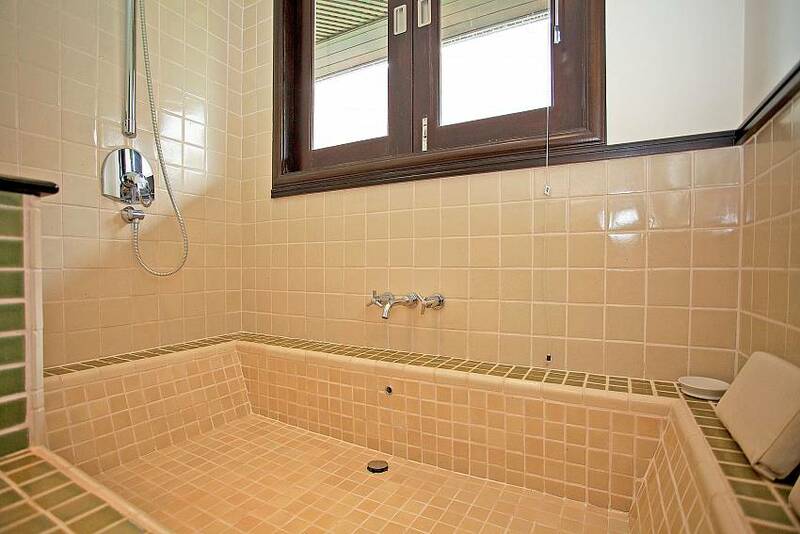 The guest bathroom has a western toilet and wash basin. 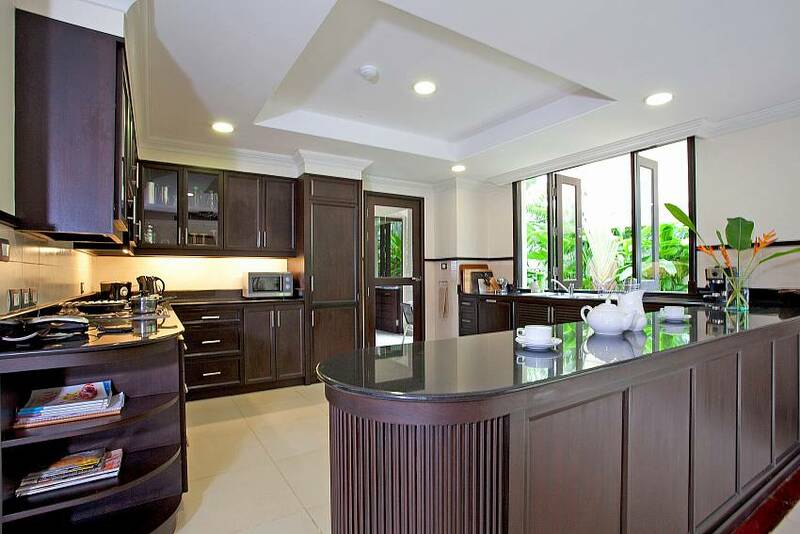 This European styled kitchen contains spacious black granite benches that are great for preparing meals, as well as polished wooden kitchen units, which are perfect for storing goods. 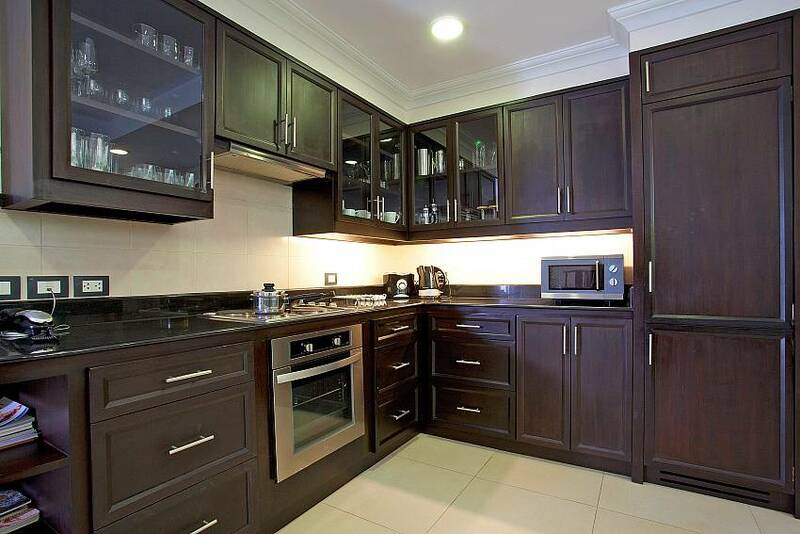 The modern appliances included are an oven, stovetops, microwave, tea and coffee making facilities, a refrigerator and plenty of fine dishware and cutlery. 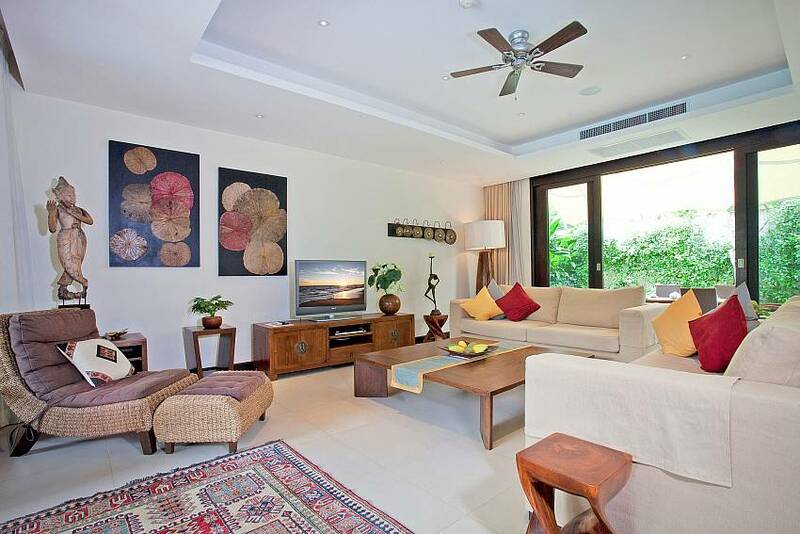 The spacious lounge room has a real sense of comfort that is heightened by the paintings and sculptures within it. The comfortable settee is a great place to sit back and enjoy the luscious garden views and if you feel like watching your favourite programs, there is a flat-screen TV with a DVD player and international TV channels, so you’ll always have options. 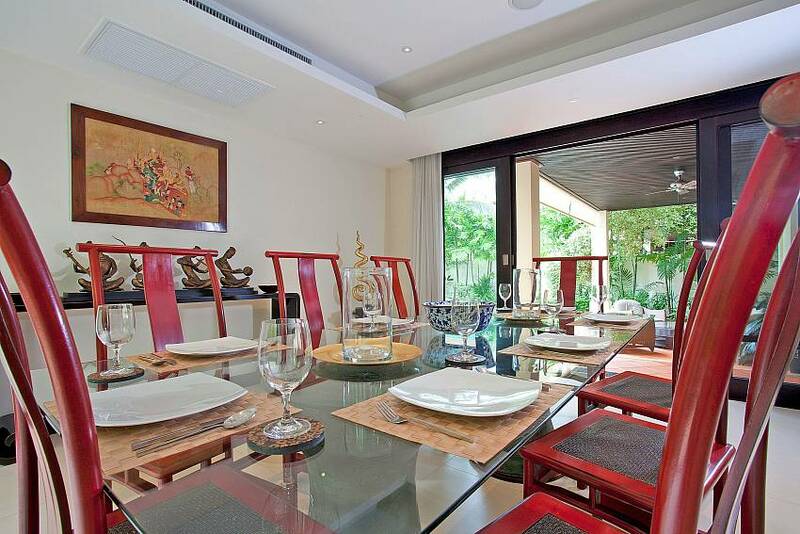 The main dining room has a glass dining table that can seat up to eight people and is surrounded by beautiful Thai furniture and art that really makes it an enjoyable place to eat. The outdoor terraces on the ground floor and the first floor are great for dining al fresco and taking in the views. "Location is perfect if you have a car. The beach in front of the village is almost the best in whole Phuket. The stuff is very responsive. 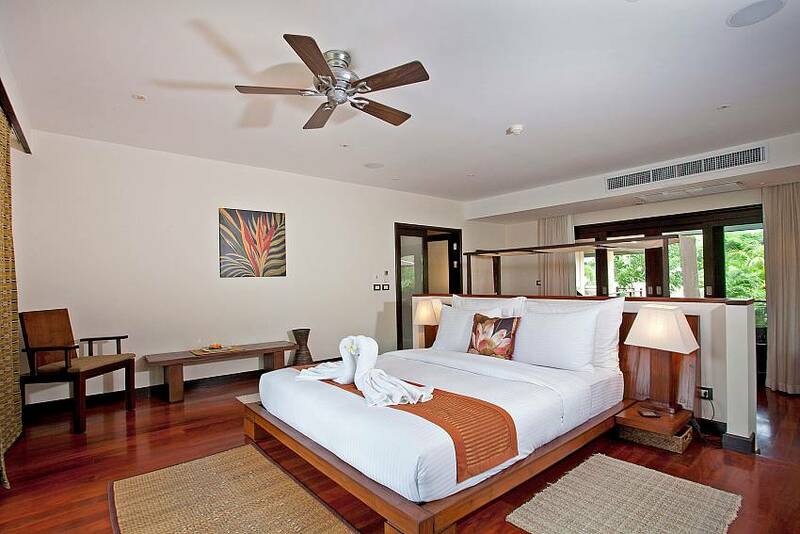 Inside the chic and spacious villa one can can have a real relax. 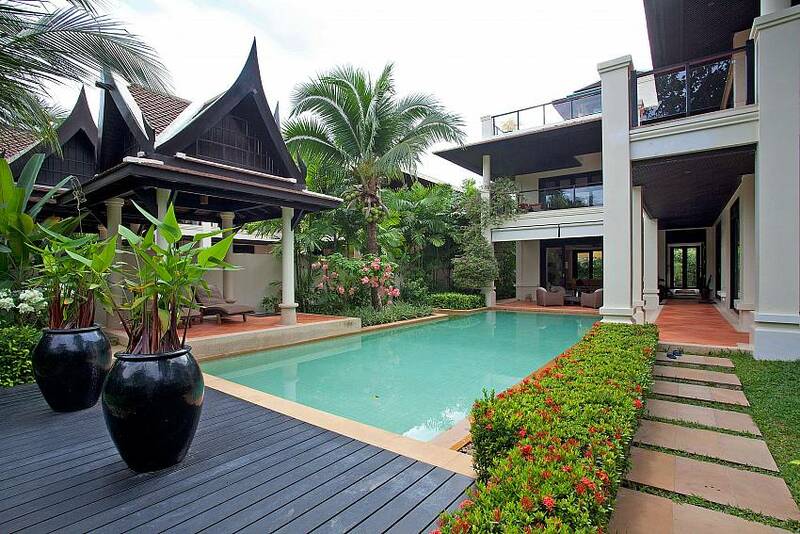 Quite big and nice pool. But on my opinion some kitchen facilities need renovation. So my average rate for villa is 9 of 10. " "Thank you for everything I have enjoyed to stay in this villa and I hope in future to be near international restaurants and shopping Thank you again"